I went out on my bike.. really nice place to ride, tons of trails and easy to get lost in it.. I didn't hike the whole trail, just some of it. It was very nice out today for a hike. Water at the falls is really going. The trail itself was nice, didn't see anyone on the trail. Just wish I hiked more of it. I basicly went from the old homestead around the trail and cut back across to the homestead again. Very nice and quiet (cept for rush hour traffic). Did the whole trail, from Spicewood Springs to the dog park. Only ran into a few people. The only problem I have with the trail now is it's becoming overgrown. But other then that, it was nice and quiet. I actully took time to stop, sit and check out the waterfalls and take some pictures also. 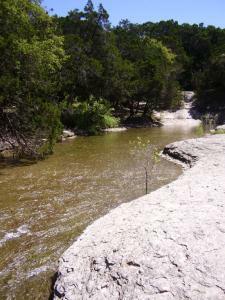 Went out and did a little hiking at Bull Creek. Looks like part's haven't seen traffic in a while and with the lack rain the water was very nasty in spot's. But other then that, nice quiet hike.